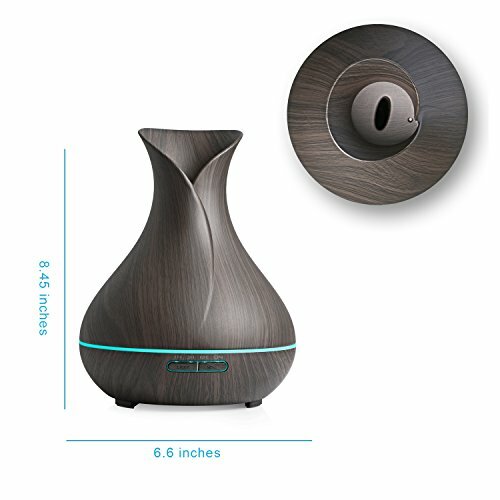 Featuring a rosebud design, this diffuser releases a massive stream of vapor out of its petals. This diffuser and humidifier model uses the latest in ultrasonic technology to bring you maximum empowerment of soul and body, releasing the tiniest of micron-sized droplets that suspend in the air longer, yielding maximum inhalation benefits. 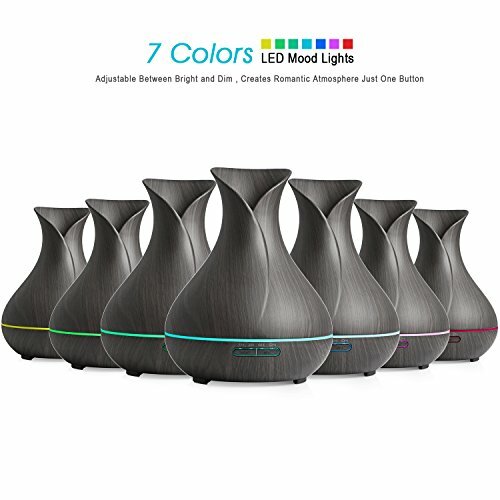 REIDEA diffuser has a light display or constant, glowing night light option in 7 different colors, it’s perfect for use while sleeping or in children’s rooms. 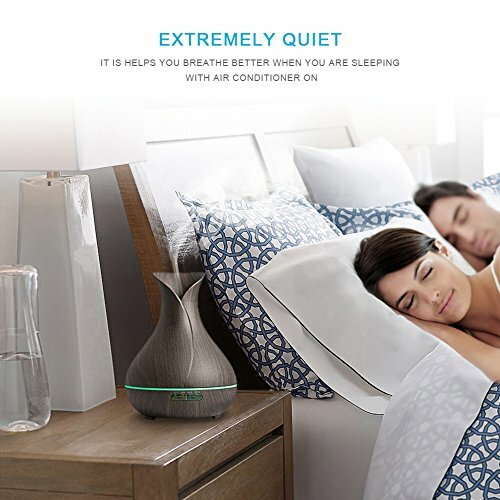 – Whisper quiet (Noise<20dB) and safe ultrasonic diffuser technology shut-off .Improved safety with cold ultrasonic diffuser technology and water sensing auto shut-off function. – Ergonomic easy-grip top is easy to remove for refilling, even with wet hands! 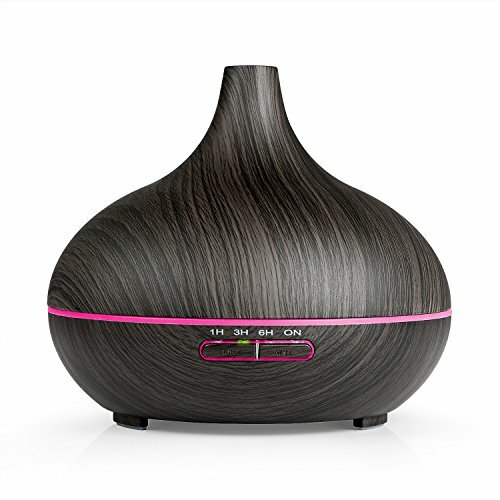 I really like the sleek wood like design of this diffuser. It has 2 settings and makes my room smell so peaceful. I love using my lavender oil before bed. I was using a humidifier to diffuse my oil and it took up half my nightstand and didn’t look nice. This it pretty and I love the colored lights! This would be great in an office or classroom too! What a great Christmas or birthday gift idea with a bottle of essential oil! Purcahsed on flash deal. Works well. Unit functioning as advertised. I’ve really enjoyed this little diffuser. It was a decent price and I love that it’s 400 mL. I would’ve given it five stars except that some of the paint was chipped when it arrived but luckily you can’t tell unless I get really close. Quick easy set up. Latge open neck that allows full mist to flow. I’ve had it 2 days. Ordering another one or maybe 2. 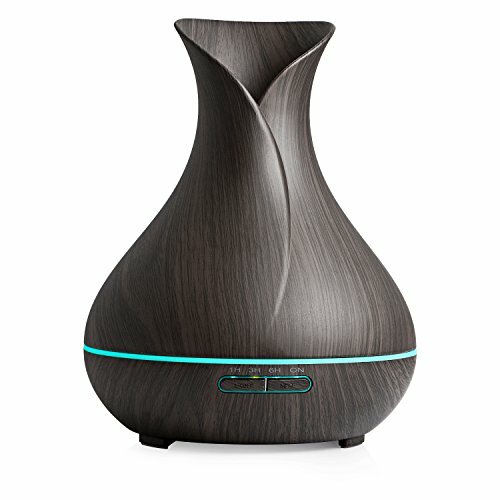 This is a great diffuser, great price ?? Love my diffuser! It’s beautiful and works wonderfully. Highly recommended. I was lucky enough to score this on a lightning deal. I absolutely love this diffuser it holds a lot of water n covers a large room. It’s looks very nice in person to. ??? love it love it love it!There’s definitely no cons on this product, just pros. ??? ?I purchased this this coz i wanted a bigger capacity diffuser and yes, it is big enough to make not just my living room but also the kitchen and extended area of the house smell good.The wooden-like print and unique shape is beautiful plus the 7 color changing lights is added fun. I also like how i can put it in different setting of hours 1H,3H and 6H.Definitely worth buying. 5?????????????? All went as it should have with this purchase. 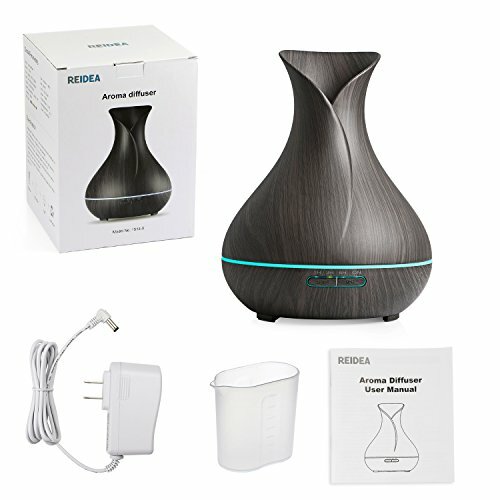 REIDEA AROMA DIFFUSER …, pretty good size at 400 ml . It’s a wood grain design, color is black & brown wood grain! Very ez to use. Add water to max line and few drops of essential oil. Clean every week ( ez to do) and you will have a very nice product that lasts a very long time. This will defuse for 1-6 hours depending on setting. And emits a colorful light if you choose. Just a small band of light. Works great and the best of all is that it starts defusing really fast. Ok. Before I bought this diffuser I had 2 other ones and I thought THEY were great. But when I got this one and turned it on I wanted to jump for joy! OH my goodness! This diffuser goes in a whole different level. It is amazing. Not only is it extremely beautiful for any area of my home but WOW I have never seen a diffuser put out soooo much mist. I have found true love. 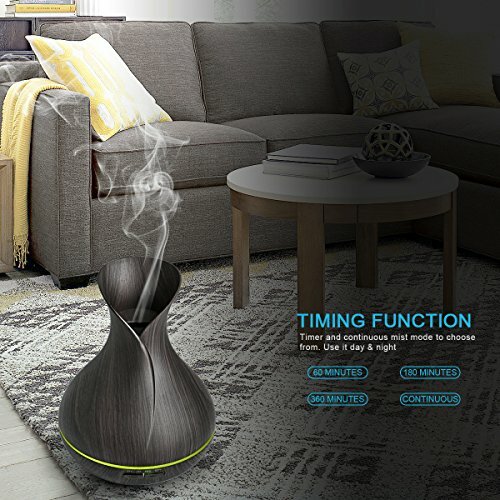 I keep this on a table by my couch and as soon as I wake up in the morning it goes on and I am up next to it starting my morning off right.This diffuser is well made, looks amazing, and puts out tons of mist. I can’t ask for anything more. My satisfaction is through the roof. I very highly recommend this diffuser to anyone. It is extremely well worth it. Best diffuser out there. Lasts 12 hours and I LOVE it. Really liked this diffuser, user friendly. And when I asked for honest feedback, they said they enjoyed it & it works well. I won this in a giveaway and I love it. I don’t hear anything at all while using this and I just love the design but the 7 changing lights put this over the top, the colors are just beautiful. ABSOLUTELY LOVE THIS! This diffuser is PERFECT! It’s beautiful! Looks just like the picture. The whole that the mist comes out of his quite large so you get a heavy mist. There is an option for a light mist if you’d like. In the picture close to the bottom you see that strip of blue? That is where the colors change. You can click to make it stay one color if you’d like. The light isn’t so bright it keeps you awake but not so dim you can’t see it. It’s super easy to use! You pop off the top, fill it with water and press the on button. There is a timer setting as well. You can choose for it to run for an hour, for 3 hours for 6 hours or to stay on until the water runs out.It comes with a measuring cup for the water but the measuring cup only goes up to 150ml. This unit can hold 400ml. I initially was disappointed because when I filled the diffuser with one 150ml cup of water it would run out of water a few hours into the night. I didn’t realize it held more water until a couple nights in when I looked at the box again! After filling it to the 400ml it stays on all throughout the night!I normally fill it with water and a few drops of essential oil, turn on the diffuser, close the bedroom door and go brush my teeth. When I get back the room smells so relaxing and spa like I climb into bed an ease to sleep. It’s incredible and I HIGHLY recommend it to everyone!If you found my review helpful, please click “yes” below. Quality oil diffuser that looks great and seems to be made of good materials. I am very happy with how quiet it is and how it spreads the vapor and smell throughout the entire room(s). I am quickly becoming a fan of essential oils over candles due to their improved safety and no flame, long lasting scent, and their ability to help humidify the air in the cold months. Although this diffuser is somewhat expensive, I am happy with the product and it works great, allowing me to recommend it to anybody looking for a quality air diffuser! I have used this for a few months now and it has helped my breathing and sleeping tremendously! Don’t know why I never thought of investing in one till now! Use this almost every night! Sometimes in the daytime..Works wonderful! Lasts all night long. Just a very good product, works great…. Ordered this for my 12 year old daughter and she LOVES it. It’s easy to use and so far seems like a quality product. Exactly what I wanted. Perfect size and makes a nice decorative piece as well. I’ve bought diffusers for my GF in the past and I have to say this is the best. We had a couple of little cheap ones that just didn’t get the job done. Not only is the look great, but it can fill a whole house with scent within minutes. I would give it 6 stars if I could. We bought this for a gift and it is beautiful. Just as described. This is a very nice looking and working diffuser. It is very easy to use. Love that it actually looks better than the picture and it is a nice picture. Would purchase again! 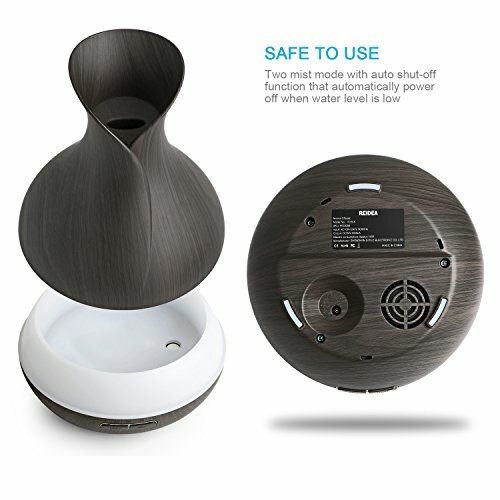 I love it, what I love the most is that it came with a little cup to put the water on it what a great idea, It has great settings and it makes a little noise when is out of water also it diffuses everything, doesn’t leave a drop of water unused. I love the lights and it looks very elegant it is bigger than I though but it looks really nice and works magnificent. This is the absolute best!!! Got my new beautiful, gorgeous, awesome, amazing 400ml aroma diffuser from Reidea !!! It has a strong an light mist setting, It has a 1,3,6 hour or unlimited timer, It has adjustable light settings you can keep one color or fade to all you can brighten or dim the light, It has many benefits air purifier, humidifier, you can use with or with out oils it has auto shut off when water runs low/out it is super quite I do not hear it at all it’s easy to set up use an clean. Iv had it on for about an hour now an it has already make a big difference for my mood an air quality im using uplift essential oil an I do feel uplifted for sure! I’m so impressed, happy, an excited to have this for my home it has met an exceeded my expectations no doubt I can not wait to see how much better this house will be after a few day of using it I don’t know how I lived with out this before! lol It’s so easy to use an understand the instructions are simple an very useful to help you set it up once you turn it on it immediately works the greatest I’m so beyond happy right now I don’t know why I didn’t get into these sooner the cost is reasonable when you think of all you get for the money it’s worth it it works so wonderfully it’s beyond amazing I can’t rave enough about this it smells amazing here oils are not included tho but I highly recommend this 400ml Aroma Diffuser from REIDEA this one I believe is called healing rose I will find a link an put it in the comments or add it to this post when I find it it can be found on Amazon or visit reidea I seriously stand behind this with my all check it out!!! !